Well, this is something I picked up as soon as I got to Quebec, where you find Maple Syrup on the table of every brunch restaurant and they have Sugar Shack (maple syrup based lunches in the extraction areas) in early spring. Then You get the cans. They’re just too pretty to throw away. 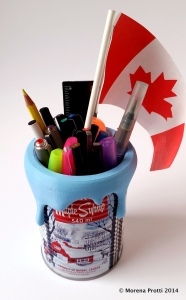 So they became a pencil holder, two, three… but somehow still cold, still just a tin. So when the paint idea come to me I was really enthusiastic and looking forward the final product done. They really do complete it nicely!